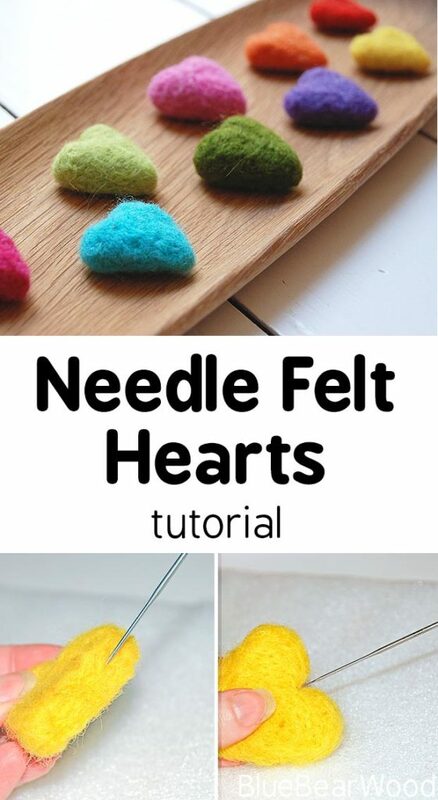 Valentines day is perfect for indulging in a load of some heart crafts and these Needle Felt Hearts are a lovely beginner project if you’re thinking of having a play with needle felt. 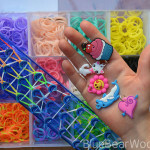 They’re quick, relatively easy, wonderfully tactile and make the cutest gifts and decorations. Other heart crafts of mine that may interest you include these pipe cleaner hearts, gorgeous yarn craft hearts, needle felt heart pebbles, heart pebbles to leave lying around or these super cute pocket pal felt heart bunnies. We have included links to resources within this post. If you purchase anything via them we may get a small commission. Put the cookie cutter on the protective pad and pull off enough wool to pack out the cookie cutter. Push the felt well in so it’s well packed out. 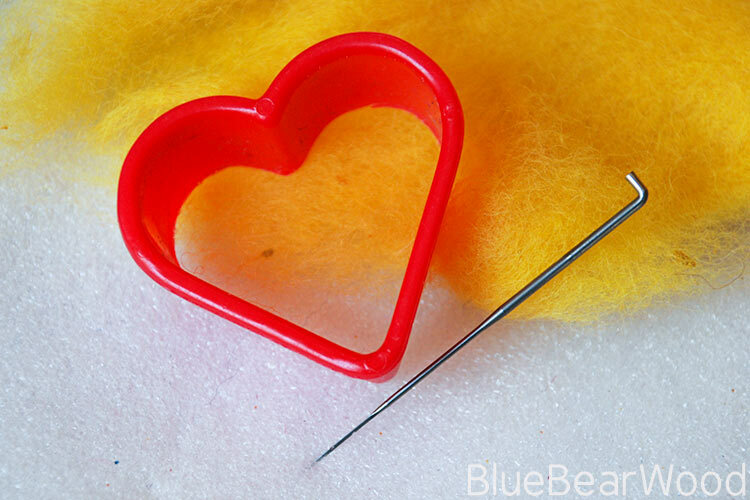 Using a felting needle poke the felt down moving the needle all over the heart area evenly until the surface is relatively smooth. You will feel the felt start to thicken. Turn the cookie cutter over and poke the felt all over again. Do either side a couple more times and then push the felt out of the cookie cutter. It will feel very soft to squeeze at this point. Now it’s time to start shaping. The first thing I do is poke down and emphasise the heart cleavage! 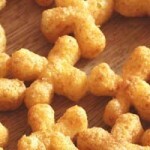 Then start neatening the edges by poking the sides in all around the heart shape. This will also fatten the heart shape. To get a rounded edge, poke the needle in at 45 degrees around the corner edges and into the middle of the heart. Again do this all around the heart. You can choose to do both sides. If you only do one side you will get a flat backed heart. Work evenly around the edge shaping where necessary until you have the heart shape you desire. It’s hard to explain but as you poke and condense the felt you also sculpt the felt. The best way to learn is to just have a go and play with moving the felt, depending on how you use the needle. A wee word of caution. 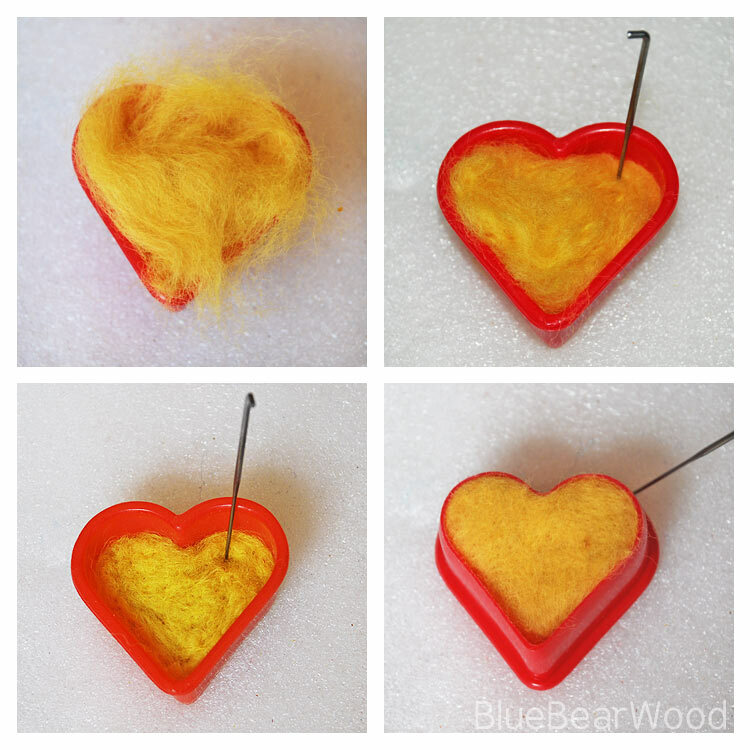 Felting needles are very sharp so keep a careful watch on things if you let children have a go. My girls are 7,7 and 8 and they ‘love’ making the heart. At the moment they find the edges a little tricky and need some input from me but I’m sure they’ll get the hang of it with practice. You can leave the heart just as it is, add ribbon to hang it with, make badges, hair decorations, beautiful garlands. The choice is yours. 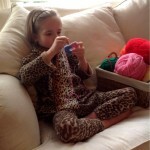 Felt hearts were shown on our weekly Google Plus Valentines Craft hangout. There were so many wonderful Valentine Crafts shown. Ooooh they are so pretty! You really make me want to have a go!!!! You will become an addict! I so want to have a go at these, where would I get a selection of bright roving wools? These are lovely! 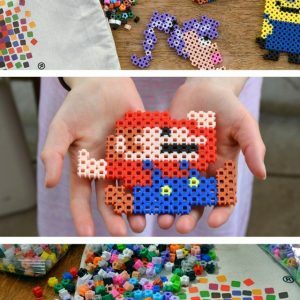 I think my seven-year-old would love this activity! Pinning! It’s a little tricky for children but they do love stabbing that needle in the felt! Oooh, I love your hearts so much! So many pretty colors! I’ve just been getting into needle felting myself and I’m having a wonderful time with it. How do you like it thus far? They really are lovely and so surprised that they look relatively easy to make! These look lovely! Using the cookie cutter to give the shape of the heart is a great idea – something I will definitely have to try! Daft question, possibly (I’m going to try this with my Guide unit next week) What size cookie cutter did you use please? And how long do you reckon it’d take an enthusiastic but not necessarily particularly skilled 10 year old? How much roving wool does it take for one heart? It depends on the size of the heart cutter your using, but you want to be able to pack in enough roving wool to fully fill the cutter. 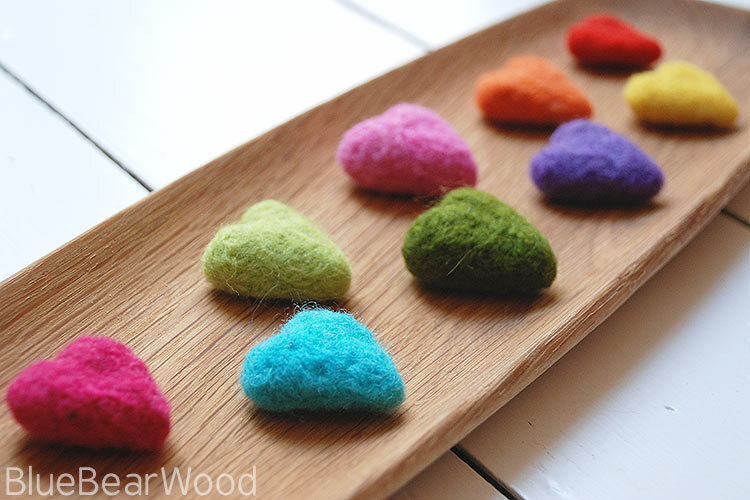 I often buy small 3-5g bundles of each colour to make lots of different coloured hearts. But if I use a lot of one colour I’ll buy a larger 50g (or even 100g).